Meet Faruq Tauheed Jenkins the ring announcer for BattleBots on the Discovery and Science Channels. Meet Faruq Tauheed Jenkins, the ring announcer for "BattleBots" on the Discovery and Science Channels. • Special delivery: "People love how serious and intense I look, but I'm saying some of the most crazy things," Jenkins said of his BattleBots openings. 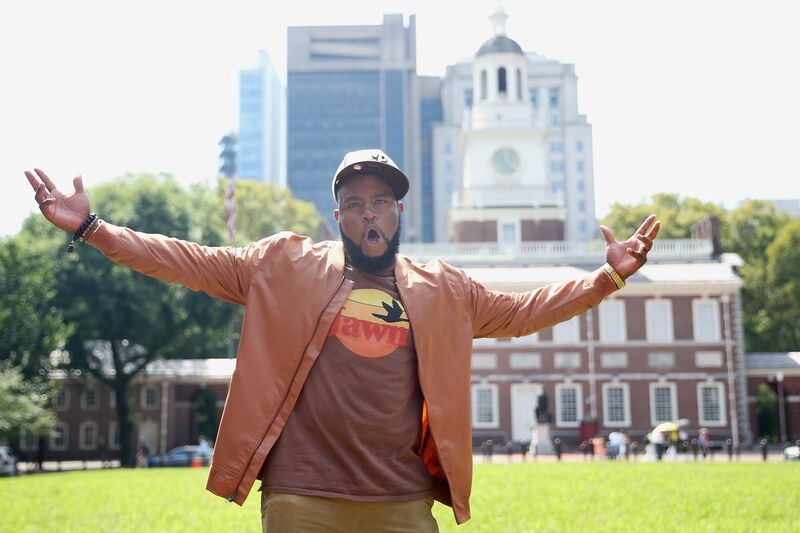 • Rep hard, rep local: "The first thing I tell people is I'm from Philly. The very first thing. … I don't know how they feel about it, but I'm gonna let you know." When BattleBots ring announcer and Philly native Faruq Tauheed Jenkins got the chance to burn Tom Brady and show the Eagles love on national TV, he did not disappoint. "In the red square, it will make you a bigger crybaby than Tom Brady," Jenkins said, as he introduced a 250-pound robot named Tantrum during an episode of the arena robot fighting show. The crowd booed and Jenkins shot back, "You think I care if Boston fans hate me?" before smiling coyly into the camera and proudly flapping his wings. "Oooh, I loved it because it was my time to celebrate my Eagles," Jenkins said. "It was just our time to shine, baby. Eagles on top!" For Jenkins, who grew up in West Oak Lane, serving as ring announcer for BattleBots on the Discovery and Science channels is "one of those dream jobs." His booming deliveries on wild intros from the show's writers like "It's the Braveheart of bots and you're about to get kilt" or "He's the Ayatollah of the remote controlla" are as silly and satisfying to watch as 250-pound robots battling to the death. And, of course, there's Jenkins' trademark phrase: "It's robot fighting time!" which is actually trademarked by BattleBots. Jenkins, who goes by the stage name Faruq Tauheed, is so popular that BattleBots spectators have started making posters just for him. It's even been suggested that he might be the best ring announcer in the business. But at one time, Jenkins was just a theater kid from Philly who had to wear tights in the hood. The eldest of three boys, Jenkins, 39, loved his childhood growing up near 72nd and Ogontz Streets, where he'd play stick ball in the street. Jenkins' mom later enrolled him in Freedom Theater, where he studied acting and dance while attending the Philadelphia High School for Creative and Performing Arts. "I was the only guy in the hood walking around wearing tights," he said. Jenkins went on to Marymount Manhattan College in New York City and moved to Los Angeles in 2001, where he's been a performer ever since. "There are a lot of people above me that their careers are more stable and locked in, but there's 20 times more people below me that would want half of what I do," he said. "It's a tough game." Jenkins is voicing the mayor on Amazon Prime's reboot of The Adventures of Rocky and Bullwinkle and he's been on several TV shows, including The Bernie Mac Show, Brooklyn Nine-Nine, and The Shield, which he auditioned for 13 times before being cast as "a pimp named Smooth." He was also a contestant on the first season of MasterChef with Gordon Ramsay and starred in the ABC/Disney movie Selma, Lord, Selma. About 10 years ago, Jenkins branched out into announcing with the video-game maker EA Sports, hosting Madden Challenge video-game tournaments across the country. When he got the call to host the reboot of BattleBots in 2015, robot fighting was a "brand new world" to him. "It wasn't like anything else to me, but at the same time it was like everything else," he said. "The passion that's inside of people for the things that they love, that's what draws me to things." Faruq Tauheed Jenkins, the ring announcer for BattleBots on the Discovery Channel, is a proud graduate of the Philadelphia High School for Creative and Performing Arts. Jenkins, who is married and has an 11-year-old son, has a passion too — for the Eagles. This year, he dyed his beard green and came back to Philly to watch the Super Bowl. "What a glorious day that was. I'm not going to lie, I cried," he said. "When that ball got stripped out of Tom Brady's hand — waterworks! Water. Works. They came pouring down, baby." Now, this announcer with the booming voice who came back to town for the Birds' season opener last week has one more wish — to introduce the Eagles. "If you just let me do it one time, just introduce the team one time, just say 'Your Super Bowl champions, the Philadelphia Eagles!' at one game, listen, that would make my life," he said. But as proud as he is of the Eagles, Jenkins is proud to be from Philly even more. He even goes by the handle Faruqadelphia on Instagram and Twitter. "Philly can be a rough city, but it taught me to stand my ground, it taught me to be strong, it taught me about resilience, it taught me about hard work. I mean that's what this city is," he said. "I've never experienced the type of passion that people from Philly got." Grandma Linda Harris has “seen it all” while guarding risque exhibits at Philly’s Institute of Contemporary for 16 years.